It is often said that good things come in small packages, and a perfect example of that is nuts! Nuts are filled with nutritional benefits and also make for a tasty snack. 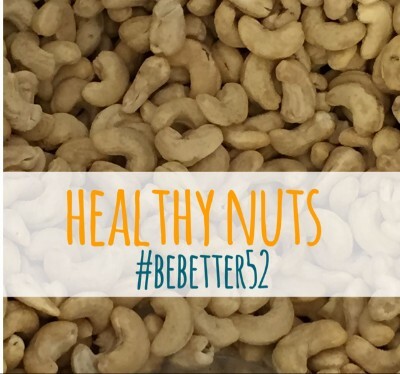 This week’s #bebetter52 challenge is to consume healthy nuts, specifically those filled with fiber, protein, vitamins, minerals or heart-healthy fats. All nuts contain omega-3 fatty acids, which are known to improve cholesterol, lower the risk of heart disease, and help with cancer, depression and attention deficit hyperactivity disorder (ADHD). Although these benefits are present in all nuts, if the nuts are paired with sugary or salty toppings or mixes, they can go from nourishing to detrimental in seconds. Nuts can also be high in calories and fat, so eating handfuls at a time is not to your benefit. The nuts with the highest amount of calories and fat and the least amount of protein are macadamia nuts and pecans, although these nuts can still add dietary value if you eat only a moderate amount. Almonds. Almonds are filled with calcium, magnesium, vitamin E and fiber. They are known to lower cholesterol and help prevent cancer. Walnuts. Walnuts contain ellagic acid, an antioxidant that helps fight cancer. They are also great for your heart and brain. Brazil Nuts. These nuts are a great source of protein, copper, niacin, magnesium, fiber, vitamin E and selenium. Pine Nuts. Pine nuts contain vitamins A, B, D, E and P (flavonoids), and contain 70 percent of your body’s required amino acids. Cashews. Cashews are rich in copper, magnesium, zinc, iron and biotin. They contain a high amount of oleic acid, which is great for your heart. There are so many reasons to go nuts for nuts. and this week we challenge you to do just that! Who doesn’t love a natural treatment? We understand the fear of needles, pills, or acupuncture for attempts to heal your body’s aches, so this week we are encouraging you to use a technique called self-acupressure. Self-acupressure, rooted in Chinese medicine, is when you use your fingers to adjust or press on specific regions of the body in attempts to heal an area where the body is having a problem. The manual pressure is typically applied by the thumb or middle finger for about 2-4 minute intervals. According to goodrelaxation, self-acupressure can clear blockage by targeting specific problem areas and opening up the flow of energy throughout the body. This renewed energy allows the body to flush out harmful toxins and can even reduce stiffness and anxiety in the body. One attractive benefit of self-acupressure is relaxation. With the daily stresses we all face, we are constantly striving for a way to de-stress and unwind after long weeks. Acupressure is similar to a massage, but it targets key areas. It can soothe muscles, help those who suffer from anxiety or muscle aches, and control one’s pain. You can even use it before a major event, like a surgery or pregnancy, to reduce the pain. Purenaturalhealing explains that by using the right pressure points, we can get glowing and more youthful skin because acupressure improves the metabolism and blood circulation in the skin cells. It is important that we understand where the pressure points on our bodies are and how to properly administer self-acupressure before we try it. Check out wikihow for some diagrams of common pressure points and useful tips. 1.) For Headaches: Apply steady pressure via the opposite thumb in the center of the web – or the “V” – between your thumb and index finger on both hands. Hold for about 2 minutes. 2.) For Sinus Support: Apply moderate pressure on both sides of your nose, where your nose and cheek meet. Hold for 3 minutes. 3.) For Relaxation and Relieving Insomnia: With your left hand palm-side up, find this pressure point at the end of your wrist crease, just below your little finger. Apply moderate pressure with your right thumb for 5 minutes. Then switch hands and repeat. 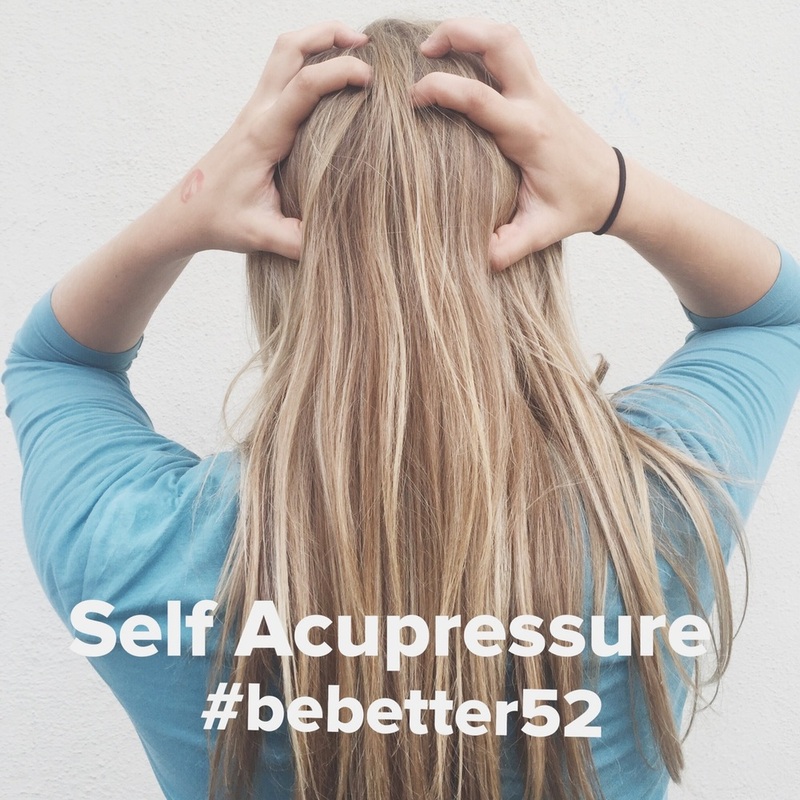 Even if you are not feeling pain this week, take a few minutes out of your week to use self-acupressure and post using #bebetter52. It is a safe and natural treatment that will leave us feeling more relaxed and pain-free. 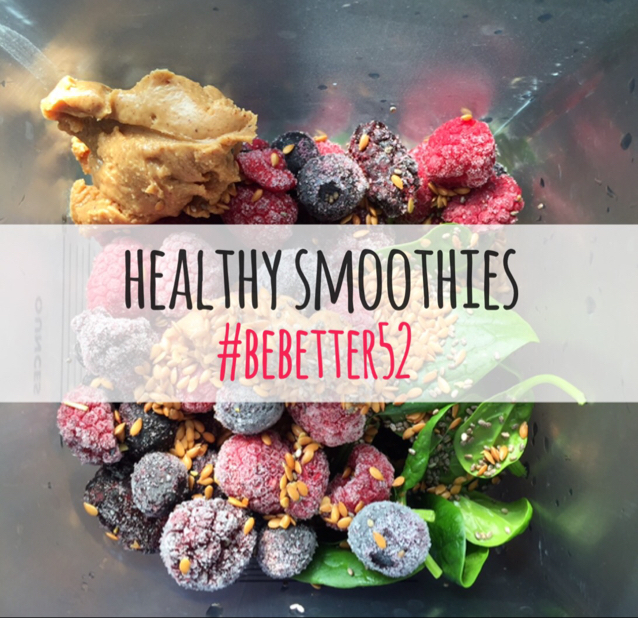 Be Better’s goal is to keep you informed about what it means to be happy and healthy in every aspect of life. 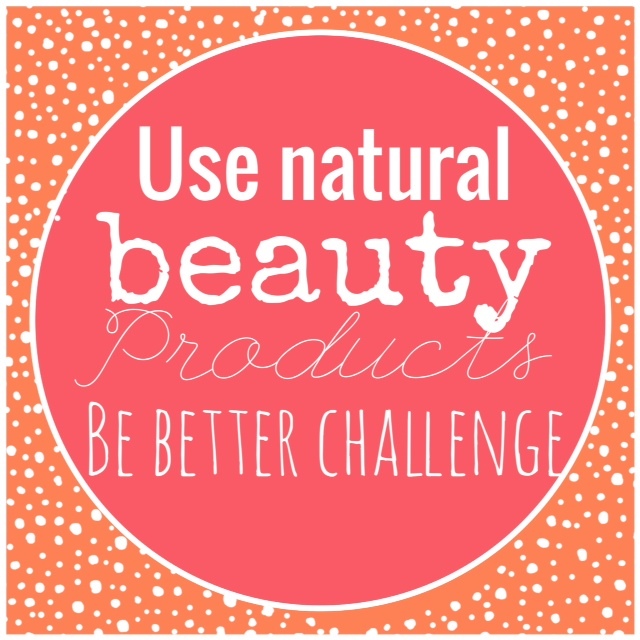 Recently we discussed the importance of using non-toxic cleaning supplies and this week we are staying with the theme to discuss all-natural beauty products. Being aware of the products you use in your home and what you directly put on your body is very important! Many people are not aware of the harmful ingredients that are present in our everyday cosmetics. Your skin absorbs up to 64 percent of what you place on it, so it’s critical to know what those ingredients are! One way to stay away from toxic chemicals in beauty products is to buy organic USDA-certified hygiene products. Make sure to look for the USDA seal, as many companies labels use words such as “herbal”, “natural”, and “organic” without having the certification. If it claims to be organic but doesn’t have the label, check the ingredients for how many are organic and which are synthetic. Look for items that are “paraben free”, and have no fillers, harsh preservatives, synthetic fragrances, sulfates, or preservatives such as ‘phenoxyethanol’. For example, many deodorants contain aluminum, which is then directly absorbed by your skin and enters your body. Look for aluminum-free deodorant such as the “Tom’s” brand from Maine. Don’t avoid all inorganic products though, as many lines work hard to use as many natural and earth-friendly ingredients as possible. When it comes to makeup do your research to find companies that have plenty of information on the quality and natural materials in their products. Many of these products can be found in your nearest natural-food store as opposed to the local drugstore. So consider using all-natural beauty supplies, it could make a huge difference in your life and your skin, and your body will thank you. For all-natural beauty supplies check LUSHusa.com, which provides handmade cosmetics. If you want to take a completely natural route you can do some mixing and use household ingredients to make your own products! Check out the wellnessmama.com blog for more information. What is the most important thing for a runner? Good shoes! Most runners will tell you their number one item when running is their shoes. Not only are shoes important for your feet, they help strengthen your leg muscles. Good shoes also help you avoid injuries and long-term problems. The goal this week: Vamp up your running shoes. You don’t necessarily have to buy new shoes. Instead, by practicing proper shoe hygiene, you can reap the benefits you’d gain from a new pair of shoes. Start with the laces. You should always tie and untie your laces when putting on and removing your shoes. Doing so provides a snug fit that will keep your shoes nice and fit your feet properly. Check in with your socks. If you wear good socks, your shoes will fit better. Finally, look into an insert if you are having foot problems. Inserts can help with balance, arches and even knee trouble. How long do your running shoes last? Your shoes should be replaced every 100 miles, or each year, whichever comes first. Visit The Runner’s Guide for more helpful information about running shoes and everything else for the modern day runner! If it has been more than a year since you’ve purchased new running shoes, head out and grab some new ones! Remember, proper shoe hygiene can keep your feet healthy and your body feeling great!